Boulanger's backpack frog, or Cryptobatrachus boulengeri, is a small frog from Colombia with a very unusual adaptation. While most frogs release their eggs into the water, where babies develop from tadpoles into baby frogs, backpack frogs belong to a family of frogs called Hemiphractidae that's unusually protective. They stick their eggs onto their backs, where the babies will stay until they're tadpoles or even little froglets. 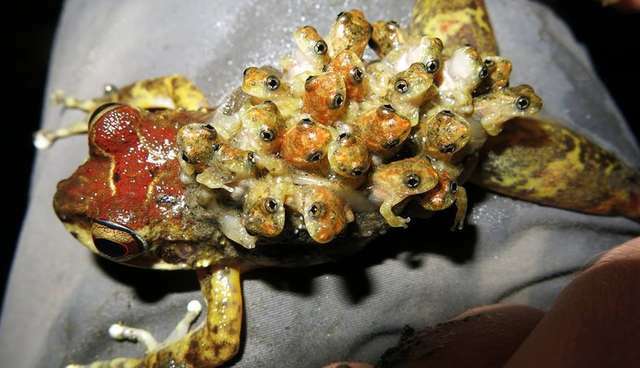 A photo shared by Amphibian & Reptile Conservation shows just how dedicated these frog moms are. Hemiphractidae aren't the only frogs with this level of dedication. The Suriname toad goes even further - during mating, eggs are embedded in her back and erode little pockets, giving her skin a honeycomb appearance. The eggs mature there before eventually being released as fully-formed little toads. Sadly, the backpack frog - and several other species of Hemiphractidae - are endangered due to habitat loss from logging and human development. If you'd like to help save these frogs and other species like them, you can make a donation to the Amphibian Survival Alliance. Click here for more unusual animals.